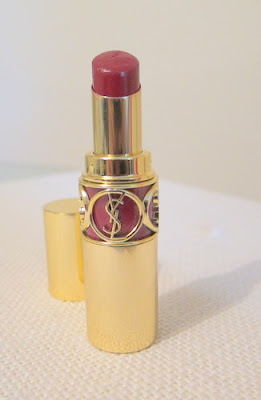 Review of YSL Rouge Volupte Perle Lipstick in 111, Mysterious Red. 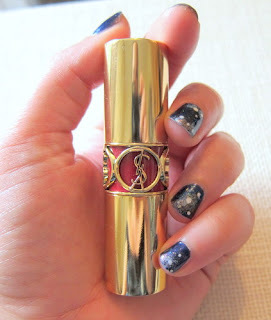 Meet my latest lipstick love! Part of YSL’s Midnight Garden collection for AW11, this is Rouge Volupte Perle in #111, Mysterious Red. I was delighted to be sent this; I’m a big fan of the brand’s original Rouge Volupte offering, thanks to its creamy, glide-on texture, fruity watermelon scent and soft, glossy finish. Well, thankfully, that's check, check, and check! 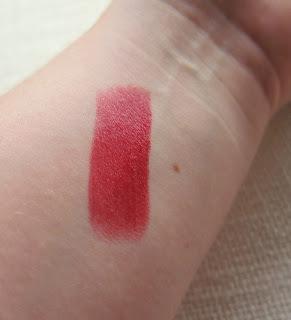 In fact, formula wise, I didn’t actually notice a huge difference between this and the original Rouge Voluptes. Perhaps the lighter colours in the Perle range contain more shimmer or are less opaque, but Mysterious Red has the same fabulous texture and glossy finish as the originals. If anything, it’s even more glossy but I can’t detect anything pearlised about it, which suits me just fine. That lovely silky texture is apparently achieved by a combination of melting vegetable waxes and silicone polymers which ensure the product “glides on easily for an instant smoothing effect. A ‘glossy film’ with a ‘mirror effect’ reflects the light for exceptionally brilliant color.” Hyaluronic acid is also present to re-plump the lips and provide a sensation of long-lasting comfort. 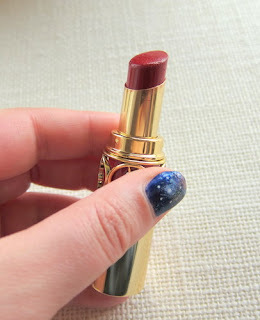 The colour and the texture combined make it a bit more high maintenance than my usual lippies but with its luxe gold casing, whipping this out to reapply regularly is no hardship at all. At €31, this is a high end price for a high end product but if you want to treat yourself or a loved one to a little bit of makeup heaven, then you can’t go wrong with one of these. Mysterious Red is one of 6 new shades, with the others being Impetuous Beige (107), Celestial Mauve (108), Brazen Plum (109), Incandescent Orange (110), and the shade used in the campaign shots, Spellbinding Violet (112). Thanks Joanne - it's a really lovely lippie! with my off coloured teeth im still unsure of all lipstick shades - but reds always bring the envy out in me. loving the packaging too. beautiful. also, on a side note - your nails are still looking fabulous!! !